In Mod of the Week, Chris Livingston scours the world of user-created adventure for worthy downloads. This week, a mod that fuses two great tactical shooters that deserve to be together. Have you been playing Door Kickers, the tactical RTS from Killhouse Games? We have, and we quite like it. In addition to a successful launch from early access in 2014, it's also become a part of Steam Workshop, letting you enjoy new maps, weapons, and skins made by other players. And now, you can spray a healthy coat of Tom Clancy's Rainbox Six all over it as well. The Rainbow Six mod does a few things to allow you to relive the first-person shooter's glory days inside a SWAT-based RTS. First up, the menus and UI have been redone, Rainbow Six style. Rather than DK's pale blue tones, you've got a sort of faded salmon theme across the screen. The high-octane electronic Doorkickers music has been replaced with a grimly patriotic orchestral score as well, letting you brace yourself for some tense close-quarters combat. Time to select the squad you want to send into a quick, bloody death. (Note: I am speaking from my own personal experience with Door Kickers. Most likely you are actually good at the game.) 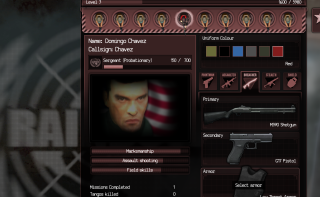 Here you'll find a number of characters from the Rainbow Six franchise, like Domingo "Ding" Chavez, John "John" Clark, and others. While you're selecting your squad, you'll notice you can now pick different colored uniforms for your unit members. This is due to another mod being included with Rainbow Six: Red Panda's Uniform Switcher mod. Click the color you want, then select the class of the unit member, and they'll be wearing their new duds during the assault. I chose bright red: that's a great, flashy, noticeable color to be wearing when you storm a mansion full of paranoid gun-toting goons, right? For my purposes, I'm also hoping it will hide all the bloodstains my crew will acquire. Their own blood, of course. So much of their own blood. It sounds like they're planning some more work on this mod in the future, including more accurate weapons and sound effects, but I'd say it's off to a good start. The mod lives here on moddb, and getting it installed and running is easy. Simply download the .rar file, and drop it into your Door Kickers mod folder (C:\Program Files (x86)\Steam\SteamApps\common\DoorKickers\mods). When you start Door Kickers, you'll see a puzzle piece icon on the main menu screen. Click it, and then click the Rainbox Six mod. Then select "Back" and the game will notify you that it needs to restart for the mod to be enabled. Once the game restarts, it's Rainbow Six time. To deactivate the mod, simply repeat the steps.